Between May 12 and Oct. 9, 2015, my band and I performed 112 concerts as part of our Mandatory World Tour, and almost every show started out with a performance of my song "Tacky." As the audience watched on a giant LED screen, a camera crew would follow me as I sang the song, starting from some point outside (or deep within) the venue and eventually winding up on stage. It was always fun for us, because obviously the venues were different every night and every performance of the song was unique. We recorded about half of these performances, and I've spent the last few days editing together this little memento. Hope you like it - see if your city made the cut! It's a cool adaption of the original "Tacky" music video concept, which featured Jack Black, Aisha Tyler, Margaret Cho, Eric Stonestreet, and Kristen Schaal. 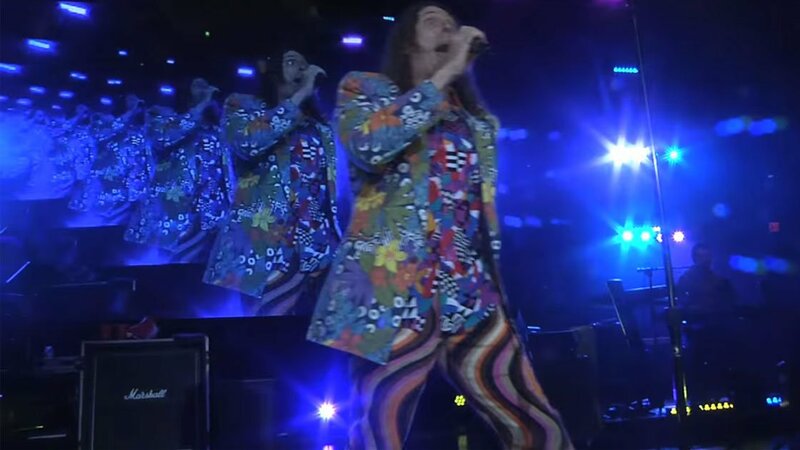 A big part of the fun here is seeing random people, concert-goers, and the touring entourage reacting to seeing Weird Al performing in his tackiest attire. The biggest drawback is that the audio is basically just the album track, not a truly live version. The song appears on Weird Al's excellent 2014 album, Mandatory Fun. Pick it up on Amazon (Vinyl, CD, MP3). You can also stream it and read our review for free here on Zumic. A couple weeks ago, Al shared some weird footage from Gröna Lund, Stockholm. For Weird Al's latest music, news, and tour dates, check out his Zumic artist page.